I sprained muscles in my back. It’s part of living the dream here. Maura’s now bigger than me, and I have a wonky back, so if she tackles me wrong, that’s it, I’m done for. Reality? I need to get into shape. Reality? I need to heal these injuries before I can start working out again. Reality? I’m kinda lazy and like to eat. Reality? I need to stop farting around and get into shape. After I heal. Thank goodness I was matched with the perfect massage therapist at my chiropractor’s office – she also does sports therapy and so is helping me with these injuries. Yesterday, Maura buckled herself into the car all by herself. She was a little “help” and I was all “You can do it” and she got it, and I was all “OH YEAH! THAT’S HOW YOU DO IT!” and we high fived. Reality? My daughter can finally buckle herself. Reality? This can be a reminder that wow, she is so far behind. Reality? I actually look at it as “SEE! Never ever give up!” because if she puts her mind to it, she’ll figure it out, even if it takes years of practice. After Maura buckled herself up yesterday, we went to the “mall” and stopped at Old Navy. 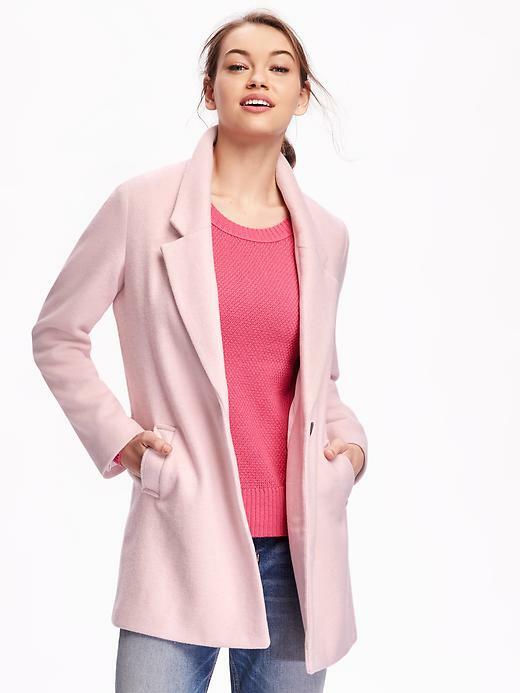 She picked out a cute dress, a button down shirt, and a pink wool coat. We went through the whole “Make sure you find the right size.” song and dance. Then we came across a pink wool coat. This is the coat from Old Navy. This is not Maura in the photo. She wanted it. I wanted her to try it on. She did NOT want to try it on. Reality? I caved finally to avoid a meltdown because she’d been so good about sizes on everything else. Reality? I chose the wrong size. Reality? I had to hide the coat from her so she wouldn’t wear it while eating food, or take it to school this morning. Reality? I will be returning to the store to exchange sizes. Reality? This is a normal thing in our life. Sometimes it’s tiring, but then I remember the time when she didn’t understand sizes at all. We’ll get there with trying on things eventually. Reality? It’s the right coat for her b/c it’s just one button and the button is big and she can button her own coat herself thankyouverymuch! This is how we roll, minute to minute, day by day. There are compromises and cave ins and celebrations. There isn’t always rhyme or reason to our ways. Our reality is that life is constantly throwing stuff at us, and while I’ve never been sporty, I am scrappy! Life isn’t easy for us…but then again, life isn’t easy. Period. Anyone who says anything different is trying to sell you something. Now, if you’ll excuse me, I must go exchange a jacket before someone gets home from school. Reality? This year my twins are able to get off the bus & walk down our driveway BY THEMSELVES. Reality? They’re almost 14. Reality? My younger twin still can’t shower herself, dress herself or put her own shoes on. Reality? I won’t always be here to assist her, so we are working on “baby steps”. Right now that means she rinses herself off after I soap her down in the shower. It may not seem like much, but it makes her feel independent & important. And me, excited that she is progressing. One of my favorite quotations right now is: “All children are presents. They just unwrap their gifts at different times.” So some gifts are being unwrapped right now; others will come later. It gives me something to look forward to! Our reality: Little Man is too smart for his own good (almost 6 years old) and Stormageddon is too strong/coordinated for his own good (2 years old). What this means? Little Man can do certain things or understand how certain things work that kids 3-5 years older than him are just learning to do….but he can’t tie shoes and is still learning his letters. Stormageddon doesn’t quite understand the concept of “danger” but is perfectly capable of climbing a ladder that twists sideways with rungs that are at least 12″ apart and is figuring out how to swing across monkey bars (also, he can throw a ball and kick a ball quite well, with actual aim). My reality with clothing sizes for my 13 year old son: Trying to convince him to try anything on is a no win situation and I swear he is always in between sizes so everything looks wrong. My other reality is the past year or so he has gotten into the habit of claiming my T-shirts as his own. Especially my Marvel ones that have the Hulk on it. I couldn’t figure out why. I even let him pick out his own T-shirts but for some reason he would still claim these shirts as his own. I just finally discovered the other day he is a fellow Hulk fan! That’s why he’s claimed those T-shirts. I bought the few T-Shirts WalMart had with the Hulk on it. So now I know I just need to buy them in my size (and get two when they are the Hulk). Should make shopping halfway easier now. Now if I could just get him to try on pants… or at the very least let me tape measure him before shopping. Buckling in is great progress! !